Johnny Lee is spilling some secrets of the Urban Cowboy era in his first autobiography, Still Lookin’ for Love, which is available now. Written by Johnny Lee with Scot England, the book includes forewords by Mickey Gilley and Moe Bandy and gives readers will get an in-depth look at Lee’s career and life, including many never-before-told stories about a secret marriage, the world’s biggest Honky Tonk Gilley’s, beating colon cancer, and the story behind ‘Urban Cowboy’, the movie that changed Johnny’s life forever. 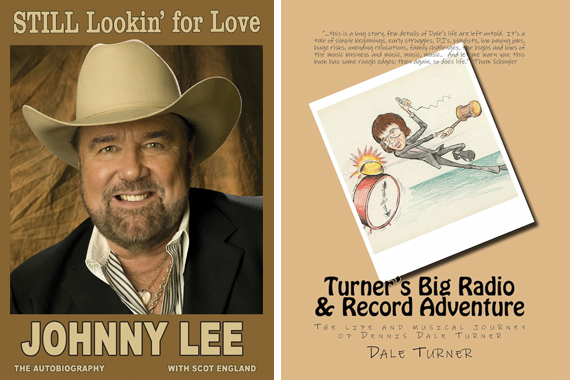 Country industry vet Dale Turner reminisces about his five-decade career in his new autobiography, Turner’s Big Radio & Record Adventure: The Life And Musical Journey Of Dennis Dale Turner. The collection includes anecdotes about his career beginning as a teen at radio station KXOK in St. Louis, with subsequent stops at WMC/Memphis, WKDA/Nashville, and WSAI/Cincinnati. Turner also enjoyed a fourteen-year stint in promotion with RCA, where he worked records from Alabama, Kenny Rogers, The Judds, and Keith Whitley. He then moved to Lyric Street, where he helped launch the career of Rascal Flatts and worked with acts like Aaron Tippin and Bucky Covington. The book is available at Amazon.com and CreateSpace.com, and in keeping with the tradition of country radio’s partnership with St. Jude, Turner will be donating 50 percent of all of his royalties from the book to the hospital.